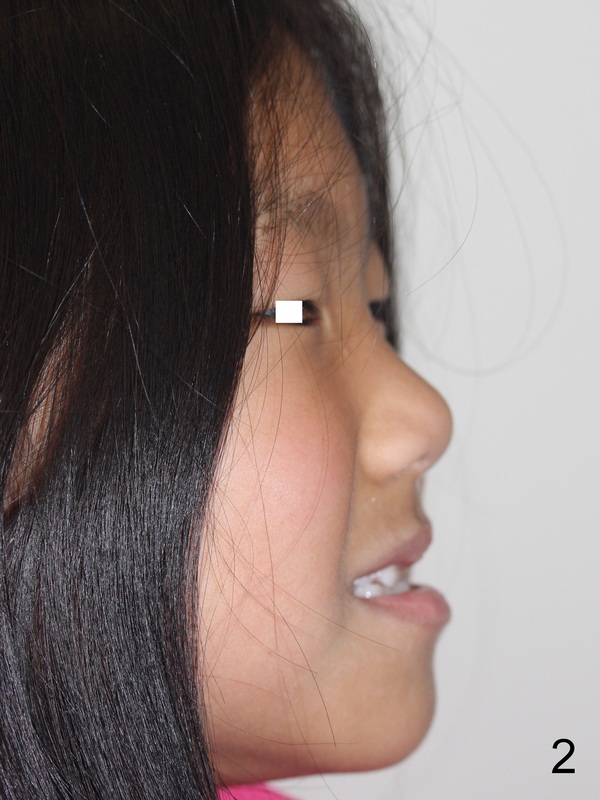 A 9-year-old girl has maxillary retrusion (Fig.1,2). Intraorally, it is manifested as the upper left anterior cross bite and underdevelopment (Fig.3: 1, B). B has mobility. UL6 is incompletely erupted. 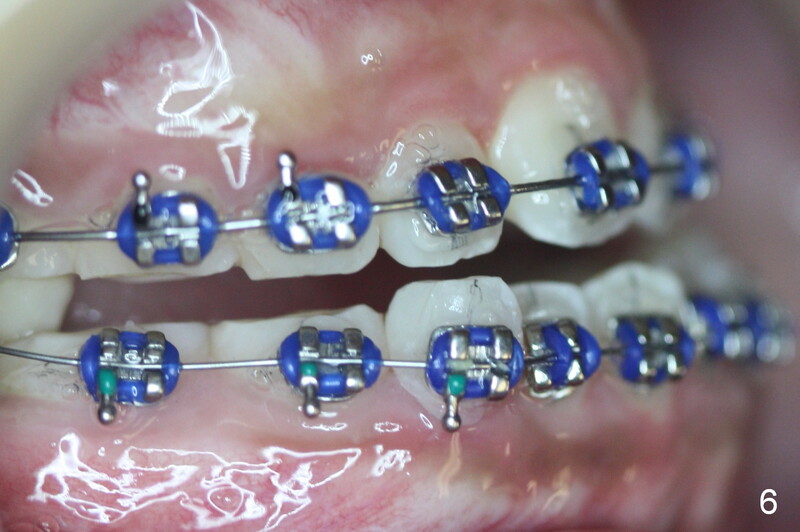 The 1st stage consists of B extraction, upper (U) bracketing, all 6s' banding, retraction between UL and LL 6s (to facilitate UL 6 eruption) and adding composite to U Es. 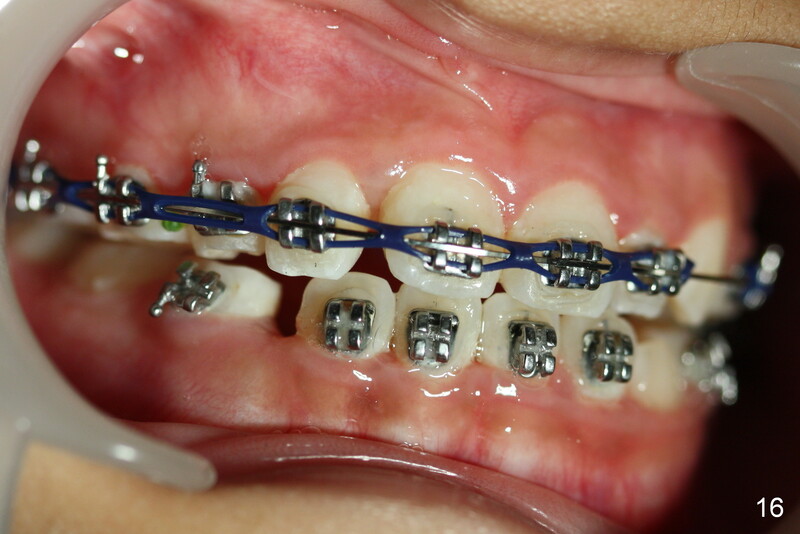 Three weeks later, the cross bite is partially corrected (Fig.4). 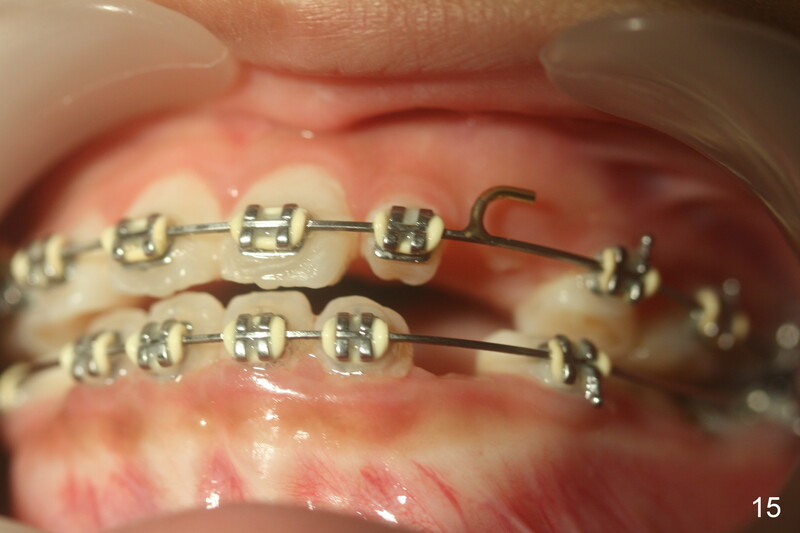 The 2nd visit post bracketing, the lower brackets are placed (Fig.5). 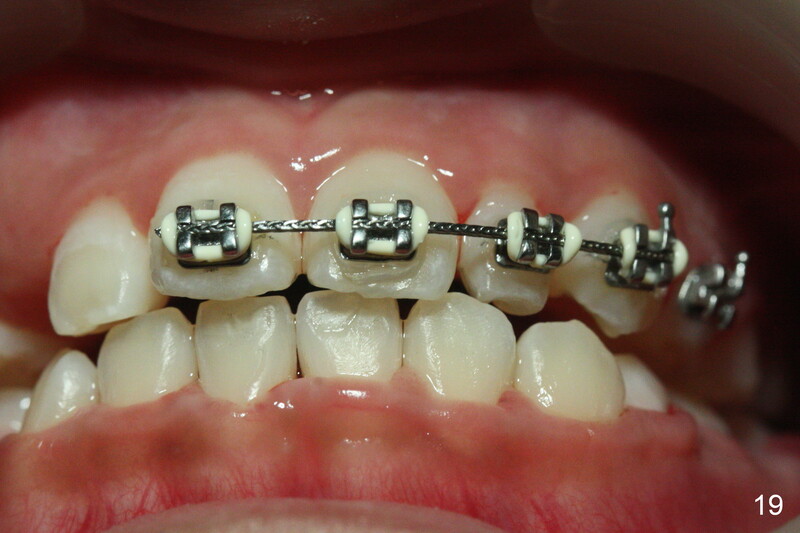 The cross bite is still not completely fixed (Fig.6). Space has been created for UL2 3.5 months post initial banding (Fig.7). 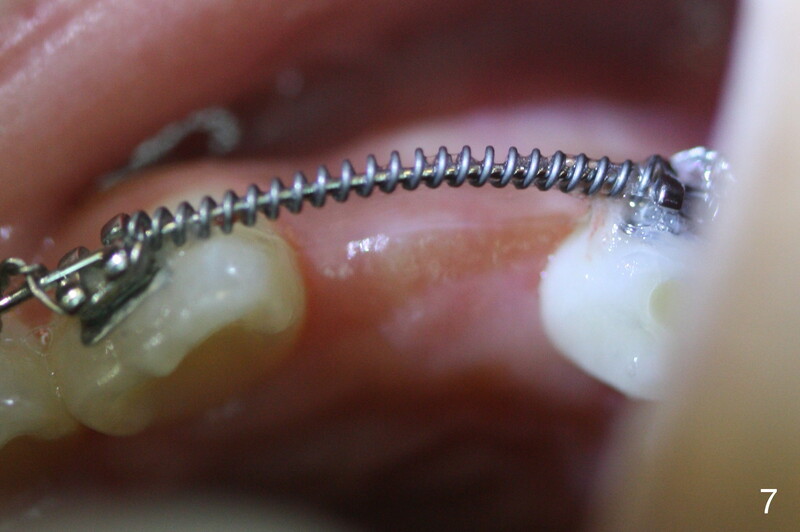 Gingivectomy is performed with Diodie Laser over the incisal edge of the unerupted tooth. One week later, UL2 is erupting (Fig.8,9). Open coil spring is removed. 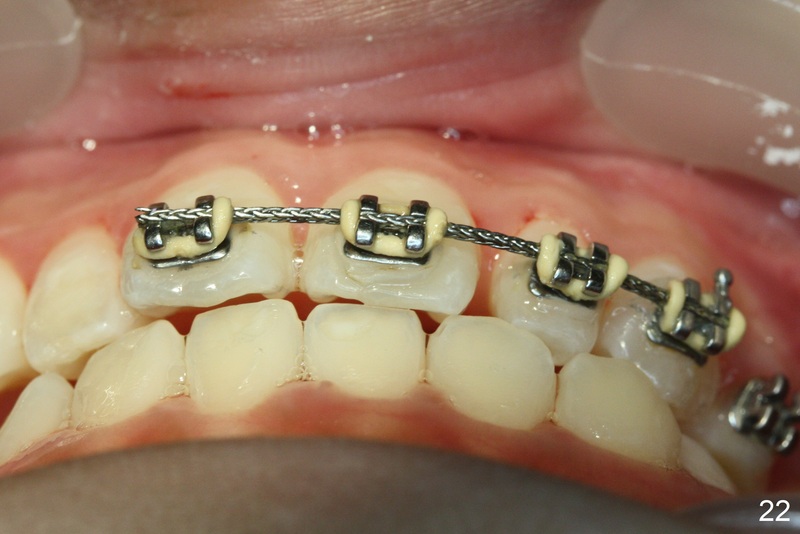 Class II retraction is placed with elastic to correct anterior cross bite. UL6 eruption is still incomplete, due to lack of constant retraction. 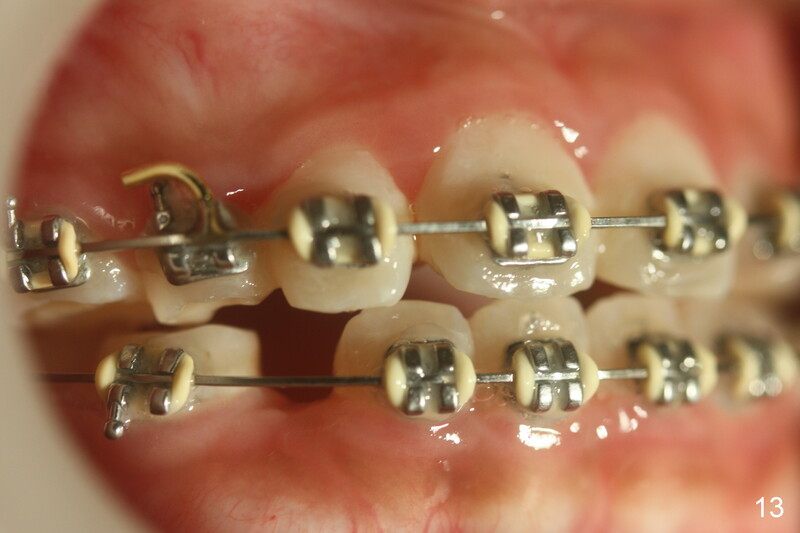 It is difficult to place band for the incompletely erupting tooth. Otherwise, face mask is used for more efficient retraction. The patient happens to travel abroad. Face bow is placed 11 months post banding. 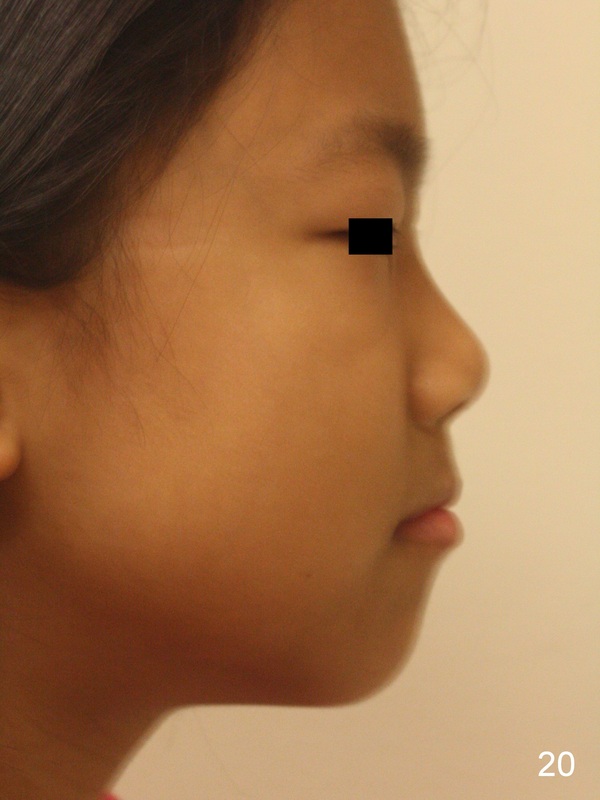 One month later (wear face bow after dinner), the facial profile (Fig.10) and cross bite (Fig.11) improve. 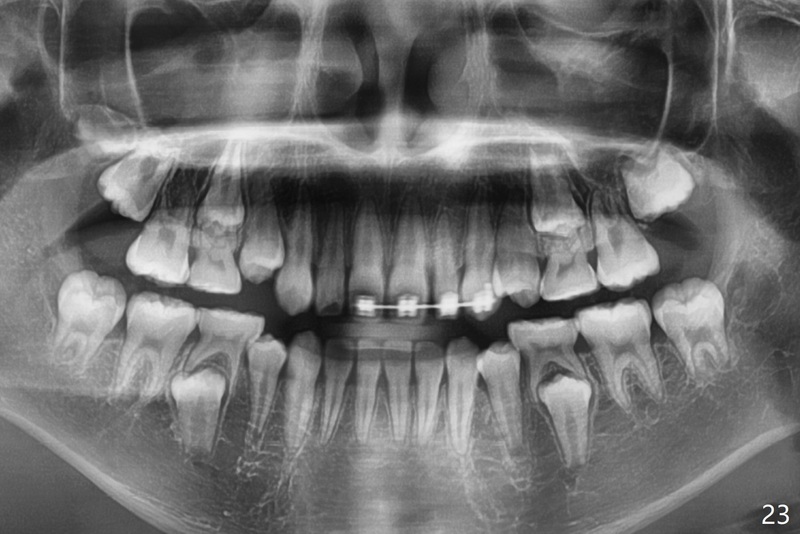 Next visit check anterior overjet and canine and molar relationship! Take photos if needed, especially for posterior occlusion. 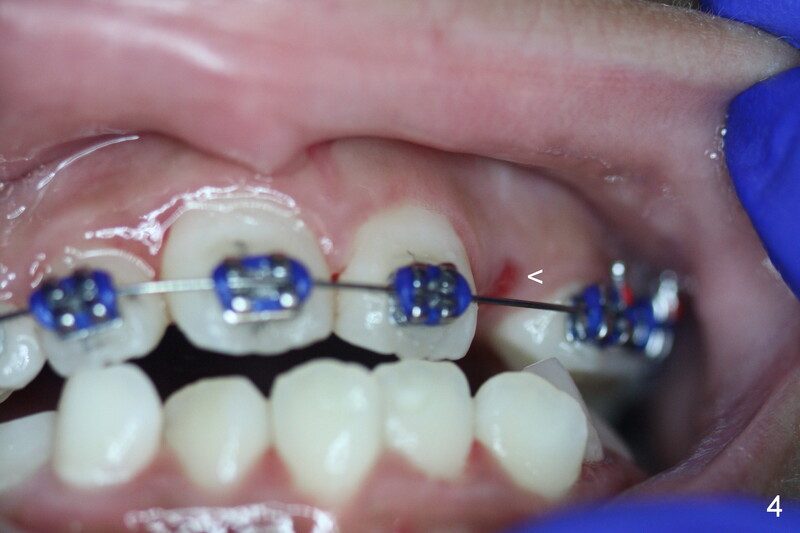 The occlusal composite is reduced in the next few appointments to decrease anterior open bite. 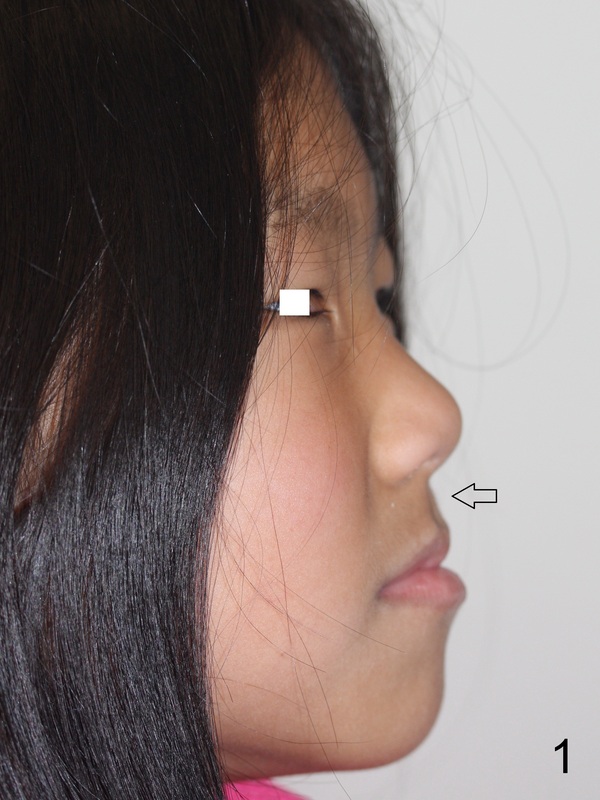 Between the 2nd and 3rd months, the patient is instructed to wear face bow after school. Overjet is WNL. Then the kit wears face bow before sleep. Fig.12-15 are taken 4 months of face bow. 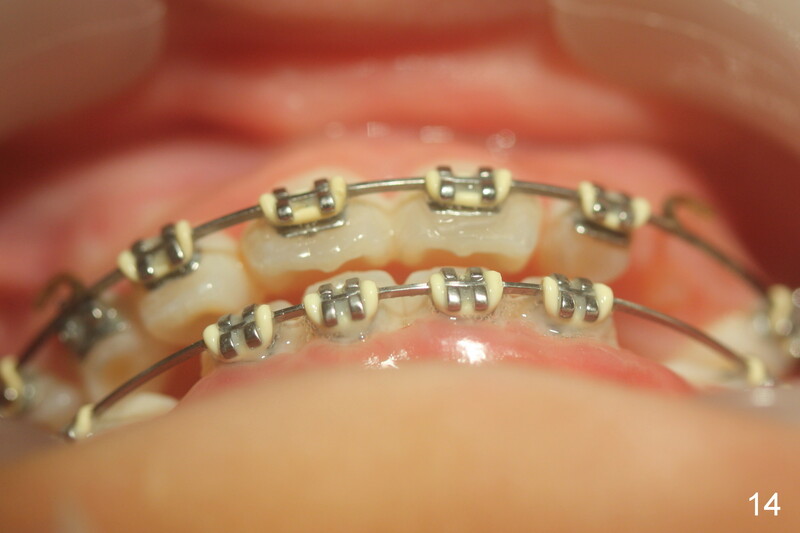 Can we ask the girl to wear it every night for 2 weeks and then every other night for another 2 weeks before removing brackets? OK Xin, just evaluated the case. 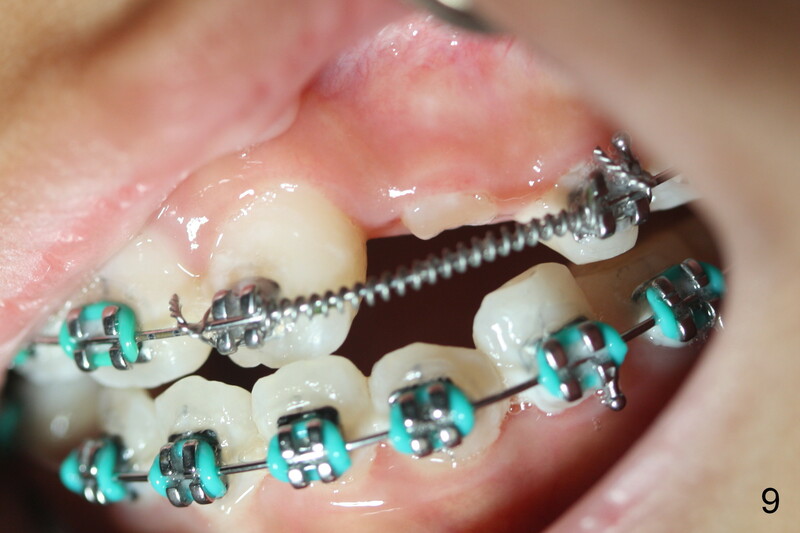 If she started with the anterior dental crossbite and you are barely over-corrected right now, I would be very comfortable discontinuing treatment. At her age, there is nothing that can no longer be dealt with beautifully when it is more age appropriate. When you refer to the facebow, are you describing a face mask for anterior traction??? 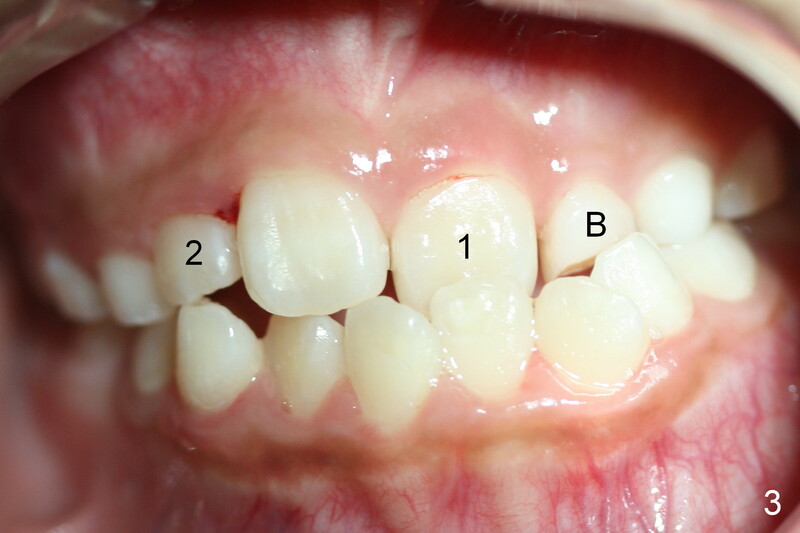 When anterior cross bite is corrected 19 months post banding, the tooth #10 (microdontia) has tendency of edge-to-edge (Fig.16,17). 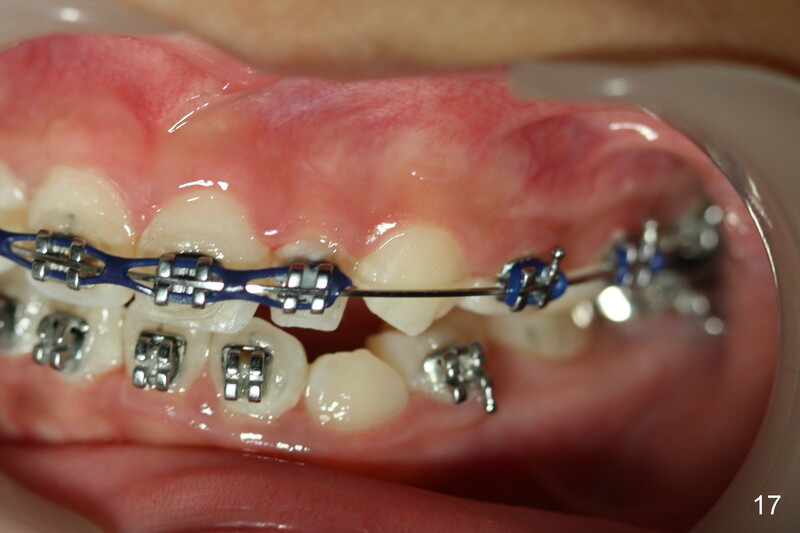 Power chains are used to create space for #11 to erupt fully before bracketing. 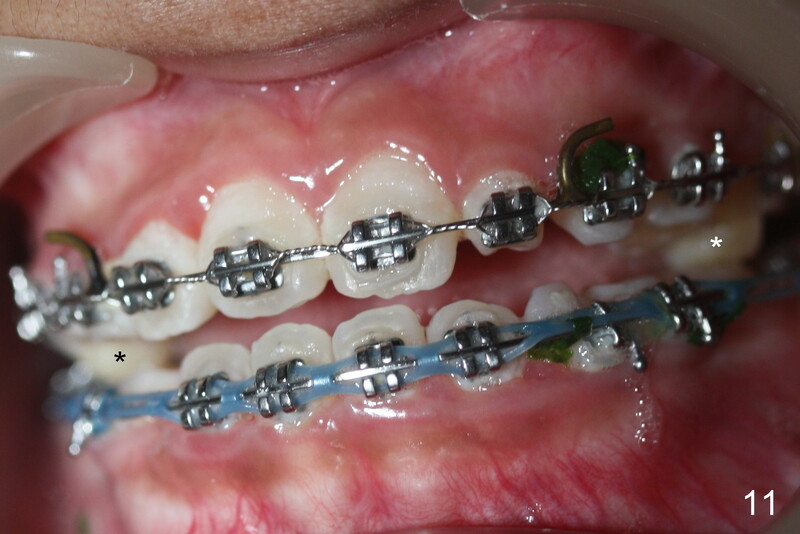 In spite of the effort, the peg lateral remains edge-to-edge 23 months post banding (Fig.18,19). 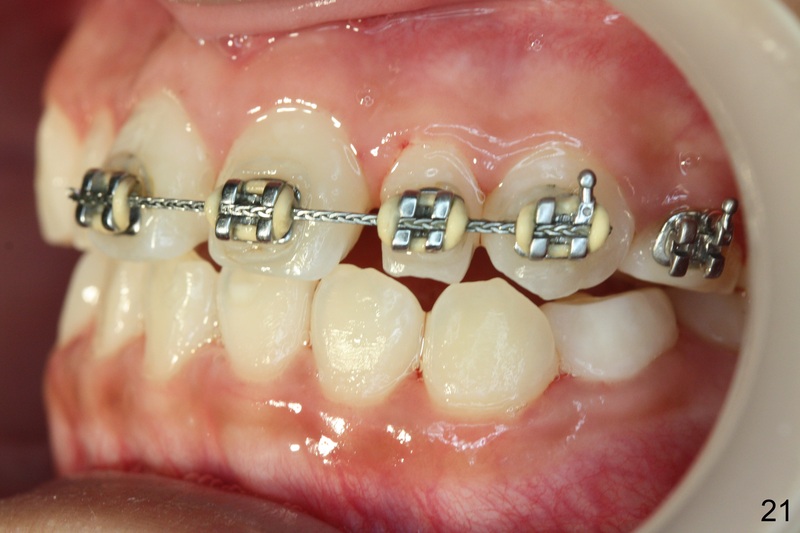 The segmental 19x26 braided wire retains as a retainer to prevent #10 from cross bite. 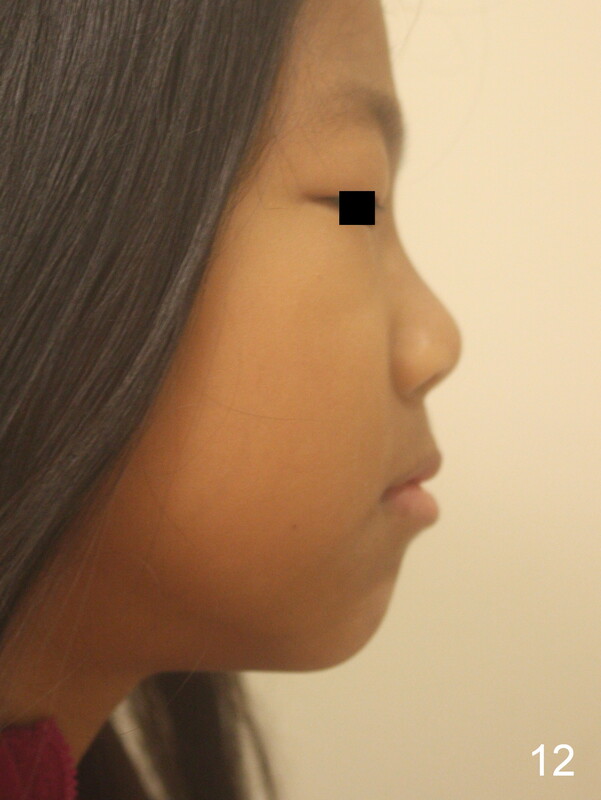 The facial profile is more or less normal immediately post debracketing (Fig.20). 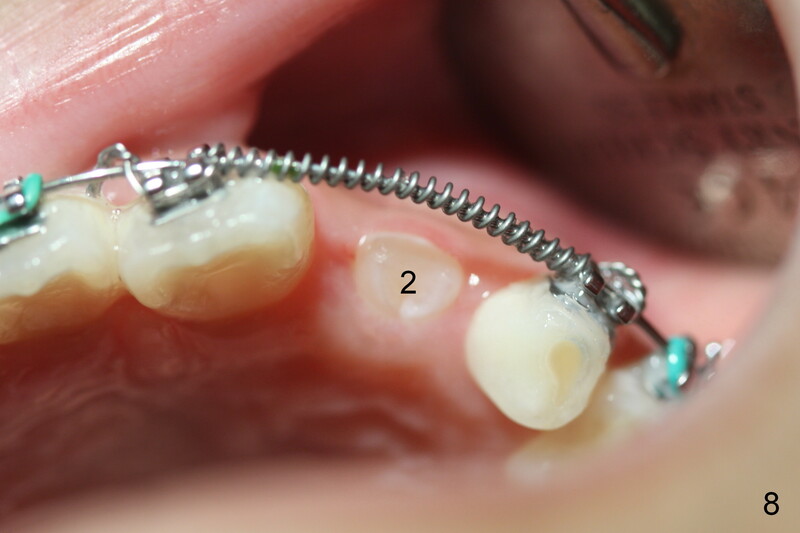 The anterior occlusion appears to remain basically the same 7 months post debracketing (Fig.21,22). 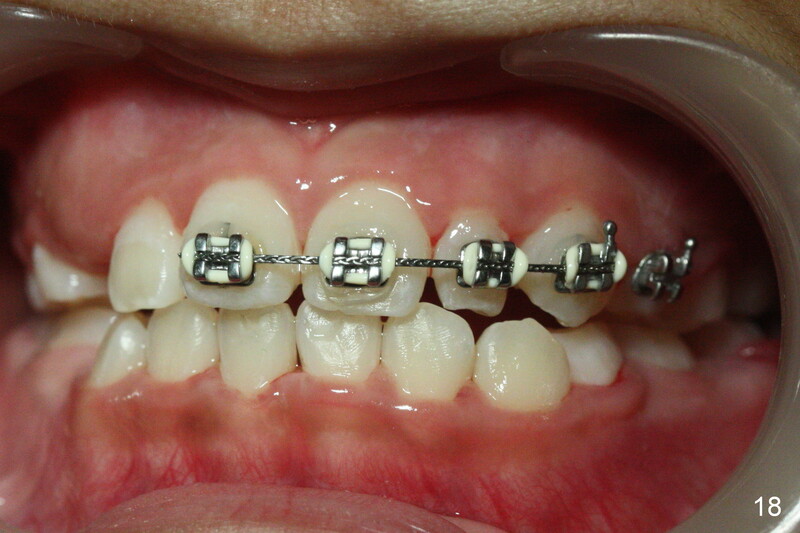 UR3 erupts, while the diastema mesial to UL2 enlarges so that the arch wire appears shorter. 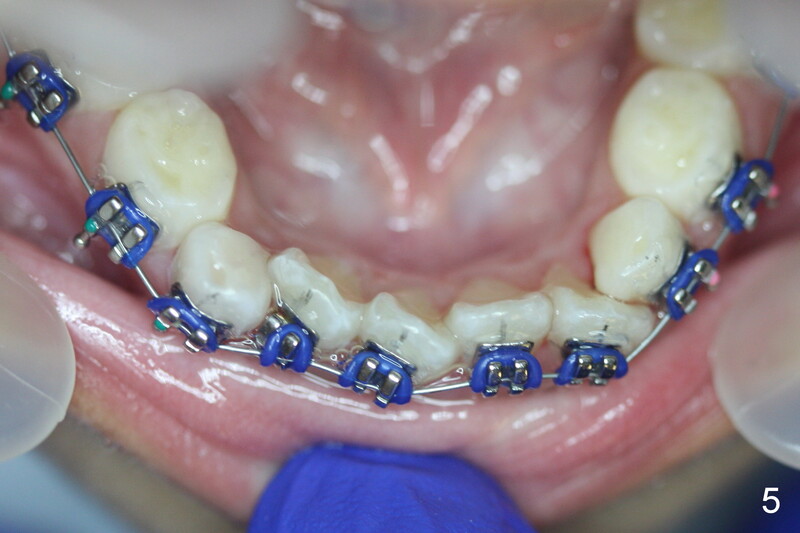 UL2,3 appear to be in cross bite 14 months post debracketing, while Es retain at the age of 13 (delayed development, Fig.23).